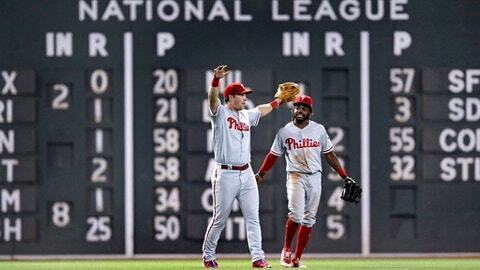 BOSTON (AP) Ending a four-game skid seemed barely a footnote for the Philadelphia Phillies. ”We went toe-to-toe with them both games and came out on top tonight,” said Rhys Hoskins, who went 1 for 3 and scored twice for the Phillies. It was especially gratifying for Philadelphia after losing the opener 2-1 in 13 innings Monday night. Jake Arrieta struck out seven in seven strong innings and Carlos Santana added an RBI single for a key run in the ninth after Hoskins led off with a double. Manager Gabe Kapler compared Monday’s loss to taking a punch in the face and said Tuesday’s win was an example of the young ball club’s growing confidence. Kapler credited Arrieta for helping leading his younger teammates through the intensity of the two-game visit between divisional leaders. After the Red Sox pulled to 2-1 in the sixth, Kapler said Arrieta was adamant about coming back for the seventh and put down the Red Sox in order. Jorge Alfaro hit an RBI double in the second and Scott Kingery drove in a run with a sacrifice fly in the fourth. Carlos Santana drove in Hoskins with a single in the ninth and that was all the offense the Phillies would need despite leaving 13 on base and going 1 for 8 with runners in scoring position. ”I think the story of tonight’s game was heart – everybody looking for the opportunity to put the rest of the team on their shoulders and carry them,” Kapler said. Martinez drove in Boston’s only run with a double in the sixth after Blake Swihart led off with a single. The Red Sox were outhit 10-6 and couldn’t rally for a second night against the Phillies’ pitching. Philadelphia second-baseman Cesar Hernandez kept Boston from scoring in the first when he noticed Andrew Benintendi start to run from third as Boston attempted a double steal with J.D. Martinez on first. Hernandez bolted in and caught Alfaro’s throw on the infield and fired it right back home in time to get Benintendi. ”When we run a redirect play, that’s exactly how we draw it up and part of the reason we run it is we have so much confidence in Cesar to execute it,” Kapler said. Phillies: Added C Wilson Ramos in a trade with Tampa Bay. Ramos is on the DL with a left hamstring strain and isn’t likely to make his debut for the Phillies until mid-to-late August, general manager Matt Klentak said. Red Sox: Placed LHP Chris Sale on the DL with soreness in his throwing shoulder. The move was retroactive to Saturday and Sale could return to the rotation on Aug. 7. … Boston recalled RHP Brandon Workman from Triple-A Pawtucket.